This image obtained by the framing camera on NASA's Dawn spacecraft shows the south pole of the giant asteroid Vesta. The giant asteroid Vesta may contain a vast supply of water ice, a supply that has sat frozen for billions of years, a new study reveals. The surface of Vesta — the second-largest object in the main asteroid belt between Mars and Jupiter — appears to be quite dry. But water ice may lurk underground over roughly half of the huge space rock's area, particularly near the poles, researchers said. And it may have been there for billions of years. "Near the north and south poles, the conditions appear to be favorable for water ice to exist beneath the surface," study co-author Timothy Stubbs, of NASA's Goddard Space Flight Center in Greenbelt, Md., said in a statement. That's because the asteroid is tilted on its axis at about 27 degrees, giving Vesta seasons akin to the ones we experience on Earth. So every part of the space rock's surface likely sees the sun at some point during a Vestan year. However, the research team — using models based on data gathered by NASA's Hubble Space Telescope and other instruments — determined that average annual temperatures near Vesta's poles are probably less than minus 200 degrees Fahrenheit (minus 129 degrees Celsius). Below this threshhold, water ice is thought to be able to survive in the top 10 feet (3 meters) or so of Vestan soil, or regolith. The average temperatures near Vesta's equator, however, are roughly minus 190 degrees Fahrenheit (minus 123 Celsius), according to the study — too high to allow water to remain within a few meters of the surface. This band of relatively warm temperatures extends from the equator to about 27 degrees north and south latitude, researchers said. "On average, it's colder at Vesta's poles than near its equator, so in that sense, they are good places to sustain water ice," Stubbs said. "But they also see sunlight for long periods of time during the summer seasons, which isn't so good for sustaining ice. So if water ice exists in those regions, it may be buried beneath a relatively deep layer of dry regolith." Water ice might be stable at the bottom of some craters for much of the Vestan year (about 3.6 Earth years), the study found. But at some point during the summer, sunlight would probably drive it off the surface, either to be lost into space or redeposited somewhere else on the asteroid. As this global map of average surface temperature shows, the warmer equatorial zone of the giant asteroid Vesta is likely too warm to sustain water ice below the surface. 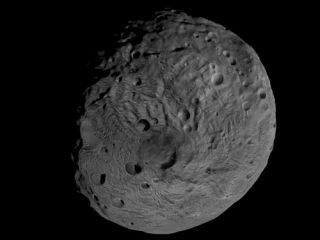 But roughly half of Vesta is so cold and receives so little sunlight on average that water ice could have survived there for billions of years. Modeling results such as those presented in the new study could soon be vetted by a robotic visitor to Vesta. NASA's Dawn spacecraft entered into orbit around the huge space rock in July 2011 and has been studying it ever since. Part of the probe's work involves searching for water with its gamma ray and neutron detector (GRaND) spectrometer, and Dawn recently spiraled close enough to Vesta to get a good look. "The Dawn mission gives researchers a rare opportunity to observe Vesta for an extended period of time, the equivalent of about one season on Vesta," Stubbs said. "Hopefully, we'll know in the next few months whether the GRaND spectrometer sees evidence for water ice in Vesta's regolith." Dawn will stay at Vesta until July, when it will depart and journey to Ceres, the largest object in the asteroid belt. It should arrive there in February 2015. Both Vesta and Ceres are so large that scientists consider them protoplanets — baby planets whose growth was interrupted when Jupiter formed. Scientists hope Dawn's observations shed light on the role water has played in the evolution of planets. "Our perceptions of Vesta have been transformed in a few months as the Dawn spacecraft has entered orbit and spiraled closer to its surface," said Lucy McFadden, a planetary scientist at NASA Goddard and a Dawn mission co-investigator. "More importantly, our new views of Vesta tell us about the early processes of solar system formation. If we can detect evidence for water beneath the surface, the next question will be is it very old or very young, and that would be exciting to ponder."